You’re probably saying to yourself, “I’ve never been on a streetcar in my entire life.” Well, better late than never. But first, let’s get one thing straight: as far as I can make out from my research there never was a streetcar named desire in spite of the stupendous fame of Tennessee’s play. Yes, there was a Desire Line but never a streetcar with this name. Of course, I’m sure New Orleanians will contest this statement if any of them happen to see it. § The first one we took and, I believe it’s the best one, is the St. Charles Avenue Streetcar that goes through the Garden District on an avenue that is lined with jaw-dropping mansions and spectacular oak trees. When this route opened in 1835, it was the second horse-drawn streetcar line in the USA. It now runs 24 hours a day and carries more than three million passengers a year. § The second one is the Riverfront Streetcar Line that we also decided to take because we were in the mood. This is a two-mile route that runs from the French Quarter near Esplanade Avenue to the Convention Center. § The third involves two slightly different lines: both run from Harrah’s Casino up to Canal Street but #1 is the Cemeteries Line that goes to City Park Avenue, while #2 goes up a spur and ends up at the Esplanade Avenue entrance to City Park. § And, finally the newest line picks up Amtrak and Greyhound passengers at the Union Passenger Terminal (UPT) and then heads to Canal and Harrah’s Casino before traveling downriver to the French Market. § Be aware: a one-way fare is $1.25. Make sure you have the correct change and remember to look at streetcar schedules. You can buy a multi-trip pass if you plan to go more than once. I can do without some things in life (maybe) BUT I can never go without coffee a couple of times a day. Okay, maybe three or four, but I’m always trying to cut back. How am I doing? No comment. I’m not about to reveal any failed intentions so let’s move on to good coffee joints in New Orleans. The first one is called Spitfire Coffee and frankly, I think that name is pure genius. 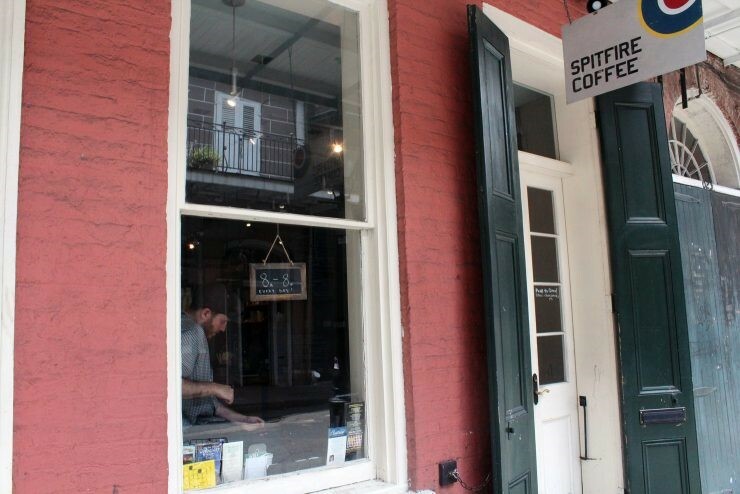 You’ll find it at 627 St. Peter’s Street (that’s close to Jackson Square) and it reputedly serves some of the strongest coffee in the French Quarter. It’s open 8 am to 7 pm Sunday to Thursday and to 9 pm on Friday and Saturday nights. The second is named Who Dat Coffee Café and I think this name is a hoot also. It’s open from 7 am to 10 pm and is located at 2401 Burgundy Street. This is a coffee shop that has great coffee plus pastries, sandwiches and cupcakes. There is also an on-site restaurant, Café Nero that has an excellent breakfast menu. We’ve heard that the Not Yo Mama’s corn cakes are super tasty. I love all these wild names! CLICK HERE to hear the New Orleans Superband play West End Blues which was written by Joe “King” Oliver and recorded by his band, The Dixie Syncopators in 1928.